Ever since I got the BB the doors have been a problem to open and close. To close them you had to stand back and (not really) throw them at the hole, for the lock to fully close. Opening them was painful on the thumb, from outside, and door handle breaking from the inside (really happened). It got to the point where something had to be done, soooo - off with the trim and start trying to find where the stiffness is. All the levers in the door seemed to be quite smooth and easy to operate, when disconnected from the lock mechanism. OK so the mechanism is stiff, hard to test in the car. 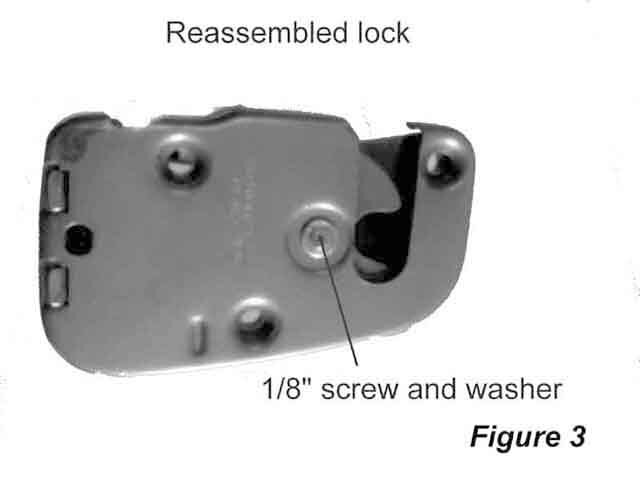 Out with the lock and I’m prepared to machine up any parts that may be worn and in need of replacing. 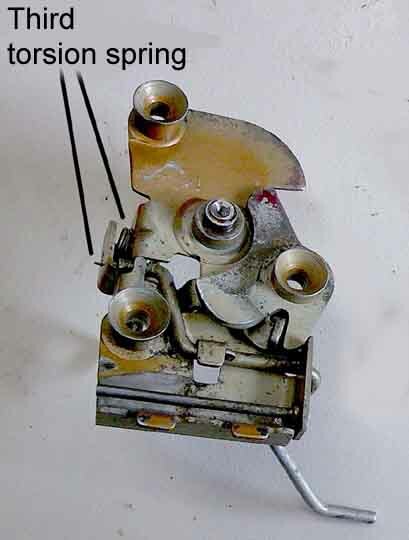 The first challenge was to open the lock mechanism to access the innards. After some cogitating I decided that the whole thing is held together by one central rivet, of the kind that is hollow and then the edges burred over. I carefully drilled the burr away, trying not to go too deep, as this rivet is also a locating pin for the cover. Anyway the cover was successfully removed, no bits went “sproing” and without disturbing anything I took a photo, as much to have a record of where things go as for this article, see Figure 1. 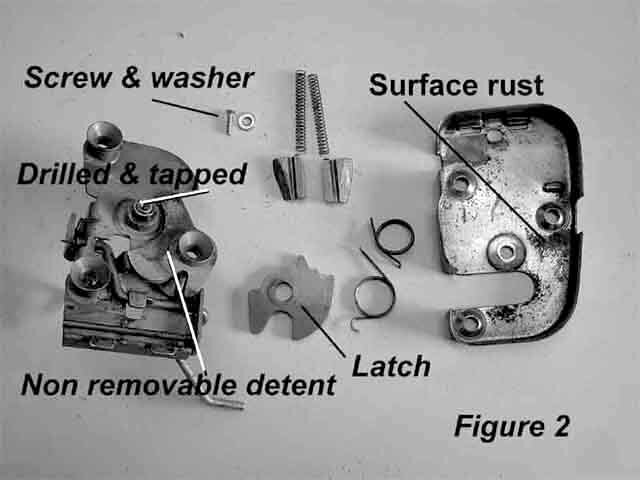 Now that the lock is apart, time to dismantle it and start cleaning all the accumulated gunk out of it. All the bits, except for the locking detent were easily removed and washed in distillate. The detent, however, couldn’t be removed, because it is riveted in, so I had to wiggle it around a lot and keep cleaning the gunk that came out with a brush and the distillate. Eventually it became free and moved without grinding. All the bits were now clean and ready to put back together. See Figure 2. Because I had drilled out the rivet holding it all together, I had to come up with a way to replace it. Simple, drill and tap for a 1/8” screw, down the middle of what is left of the rivet. Now greased all the moving parts and started to reassemble. 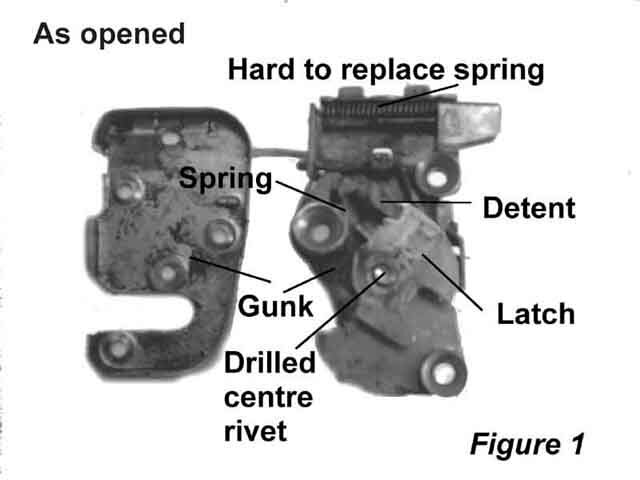 Well the upper collet type thingy, which, with its mate, engage the pointed finger thing on the catch plate, presumably to stop movement when the door is closed, has a spring that when the collet is pushed in so that the cover plate can be put on, pops out. 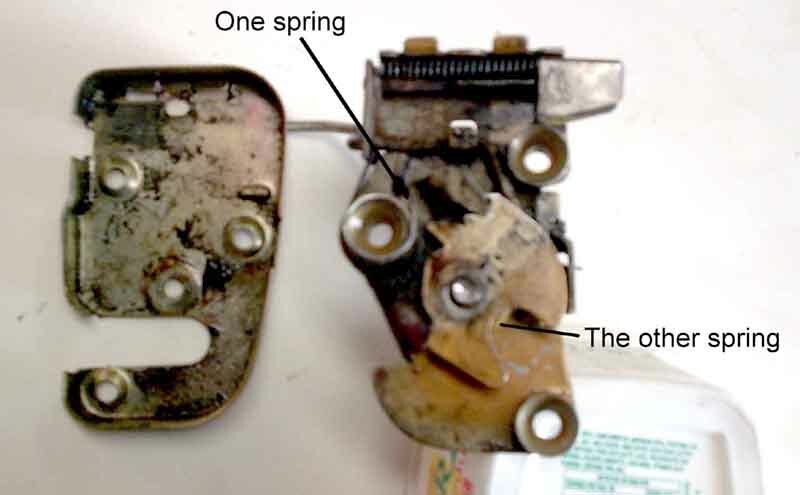 Luckily there is a opportune hole in the cover plate that allows a screwdriver to be inserted to restrain the spring long enough to get the cover plate into position. Now with a 1/8” countersunk screw, a cupped washer the whole thing was held together. Remember that once back in the car everything is held in place by the three hefty lock mounting screws, so this small screw doesn’t have to hold much. See Figure 3. After replacing in the car the difference in operation was unbelievable, almost as light as a feather. Another annoying problem fixed. Many still to go.